A very touching moment happened in a busy subway station in the last week. A young man was struggling to tie his tie. At a moment's notice, an elderly man steps in to save the day and help a stranger in need. The photo of this moment, captured by Facebook user Redd Desmond Thomas of Atlanta, Ga., quickly went viral this past week with over 200,000 shares. Facebook users from all over expressed their feelings on the situation. "Angels come in all colors!" cried one user. Another said, "So amazing, so helpful, what life should be like EVERY DAY! People helping people!" 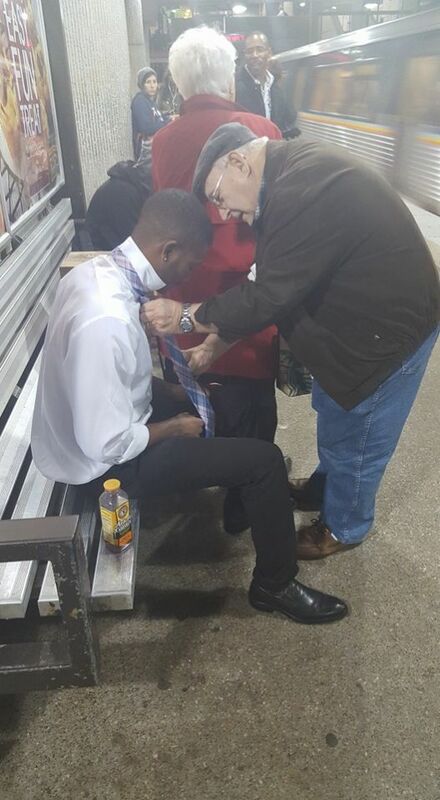 "The young guy sitting down was struggling with his tie. "She taps her husband and says 'Come to this side [her right side; he was standing on her left side] and teach this young man how to tie his tie. "The older gentleman moved without hesitation [almost a reflex response] and gave him a step-by-step tutorial; then — afterward — the elder gentleman watched the young gentleman repeat the steps and show him that he had it. "I was some distance away (but close enough to hear the exchange), and got even closer to snap this candid photo of the tutorial in progress before hopping on the train. This post was republished from sfglobe.com. You can find the original post here.